Every month I publish real estate market data for Stonebridge as well as many other neighborhoods in Spanish Fort. Stonebridge is one of the most popular neighborhoods in the city so if you’re thinking about buying a home or selling one, you should find these figures helpful. Yes, there are 30 homes for sale in Stonebridge but don’t let that scare you. Not only is Stonebridge a large neighborhood but it’s also a fairly new development with a lot of new construction in action. This neighborhood is fantastic for anyone who wants to purchase new construction from around $215,000 to $350,000. Stonebridge is very attractive with Craftsman style homes and has great neighborhood amenities. The highest priced home is $404,290 and the lowest priced home is $215,900. These figures come from the real estate data in the last 60 days. The numbers speak for themselves. With 11 homes sold in the last couple of months, you can tell that Stonebridge is very popular. The largest home had 2,942 square feet and sold for $309,900. The smallest home had 1,706 square feet and sold for $201,050. For the 11 homes that sold, the average price per square foot was $117 with a 94% listing to selling price ratio. This means that Stonebridge is still in a buyer’s market. To find a ton of information about the neighborhood and homes for sale there, please visit Homes for Sale in Stonebridge. 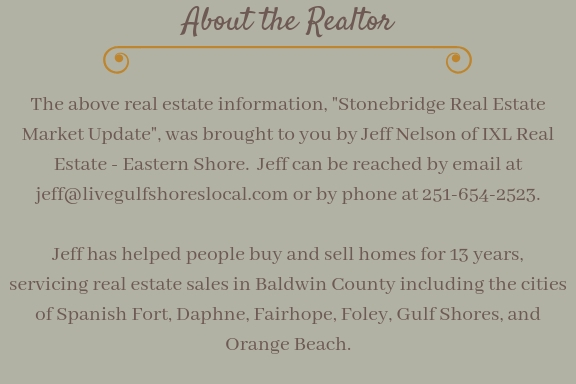 If you’re thinking about buying or selling a home in Stonebridge give me a call or send me an email from the info below.